For over 70 years, American photographer Art Shay has documented life, combining his gifts of storytelling, humor and empathy. Born in the Bronx, New York, in 1922, Art Shay has pursued photography since his teens, and he took his first Leica to war with him. His first published photographs—documenting a midair collision over his English Air Base—were printed in a September 1944 issue of Look magazine. In fact, during World War II, he was then lead navigator on 30 missions in the Eighth Air Force. His service, which also includes 23 combat supplies missions, earned him five Air Medals, the Distinguished Flying Cross and the French Croix de Guerre. Upon returning to civilian life, Shay then wrote Sunday features for the Washington Post before becoming a staff reporter for Life magazine. In San Francisco at age 26, he became Life’s youngest bureau chief. His specialty was story ideas and he wrote text and captions for photographers such as Alfred Eisenstaedt, Peter Stackpole, Wallace Kirkland and Francis Miller. The New York Times also featured the image in their review of the exhibit, on view through April 15, 2018. Pfc. Tony Vaccaro played two roles during WWII: combat infantryman and unofficial photographer. At great personal risk, he shot and developed 8,000 photographs from the front lines that showed the camaraderie, the bravery and the tragedy of war – in a way no one had done before. Directed by Max Lewkowicz. An HBO Film. 71 Minutes. DVD Extras included. Closed Captions. Pre-Order Now. Expected Delivery December 2017. 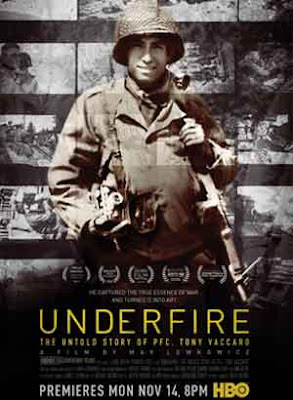 Directed by Max Lewkowicz (the New York Emmy-winning Morgenthau), UNDERFIRE: The Untold Story of PFC. Tony Vaccaro is the remarkable story of WWII infantryman and photographer Tony Vaccaro, who created one of the most comprehensive, haunting and intimate photographic records of combat. Through interviews with Pulitzer Prize-winning photographers and Vaccaro himself, this moving film examines issues raised by witnessing and recording conflict, following him as he retraces his journey across Europe as a soldier, sharing the stories behind some of his most powerful pictures along the way. Featuring contributions from Pulitzer Prize-winning NY Times photographer Tyler Hicks, Anne Tucker, curator of the Fine Art Museum of Houston, James Estrin, of the Times, and John Morris, former photo editor of Life Magazine and Robert Capa. Executive Produced by Tim Van Patten (Game of Thrones, Sopranos). An HBO Film. *Emmy Nominated for Outstanding Historical Documentary. "No one got closer than an infantryman in war, and no one got closer than Tony." -Alex Kershaw, Historian and New York Times best-selling author, "The Liberator"
Monroe Gallery of Photography is pleased to represent the fine art photography of Tony Vaccaro. "Tony Vaccaro at 95" will be on view in the gallery November 24 - January 21, 2018. Texas Book Festival panel discussion of "Eddie Adams: Bigger than the Frame"
"Eddie Adams: Bigger than the Frame"
Drawn from the Briscoe Center's Eddie Adams Photographic Archive, "Bigger Than the Frame" presents a career-spanning selection of a renowned photographer's finest work. In addtion to Adams's much-praised Vietnam War photography, the book includes images that uncannily reflect the world and domestic issues of today, including immigration, conflict in the Middle East, and the refugee crisis. They attest to Adams's overwhelming desire to empathize with others and tell their stories–as he once observed, "I actually become the person I am taking a picture of. If you are starving, I am starving, too." Best known for Saigon Execution, his Pulitzer Prize–winning photograph that forever shaped how the world views the horrors of war, Adams won more than five hundred awards, including the George Polk Award for News Photography three times and the Robert Capa Gold Medal. The Jones Center is located at Seventh Street and Congress Avenue. Street and garage parking are available nearby. Eddie Adams' fine art prints are available from the Monroe Gallery of Photography. 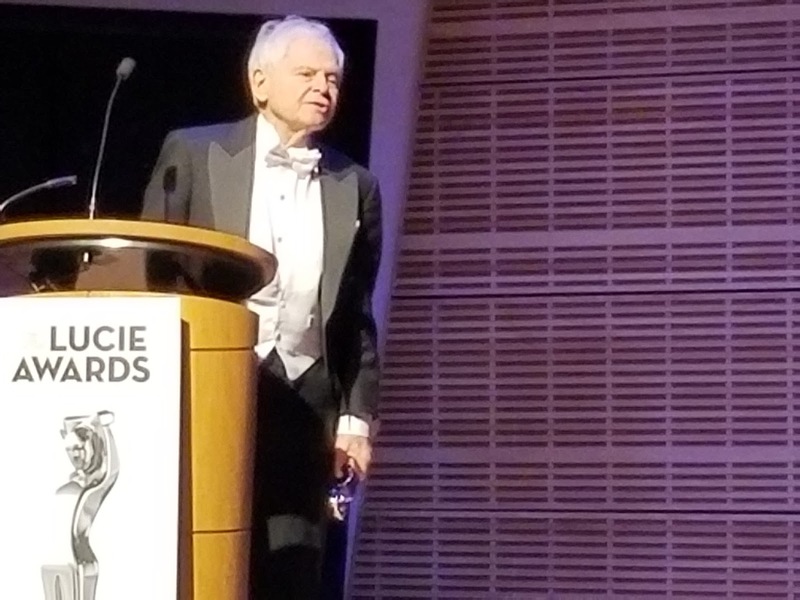 Steve Schapiro speaking after receiving the 2017 Lucie Award for Achievement in Photojournalism. Earlier this year the Gallery presented the exhibition "EYEWITNESS" to celebrate the completion of a project based on James Baldwin’s 1963 book, “The Fire Next Time”. Steve Schapiro’s photographs documenting the civil rights movement from 1963 – 1968 are paired with essays from “The Fire Next Time” by James Baldwin in a major book published by Taschen in March. The book won the 2017 Lucie Award for Book Publisher of the Year (Limited). 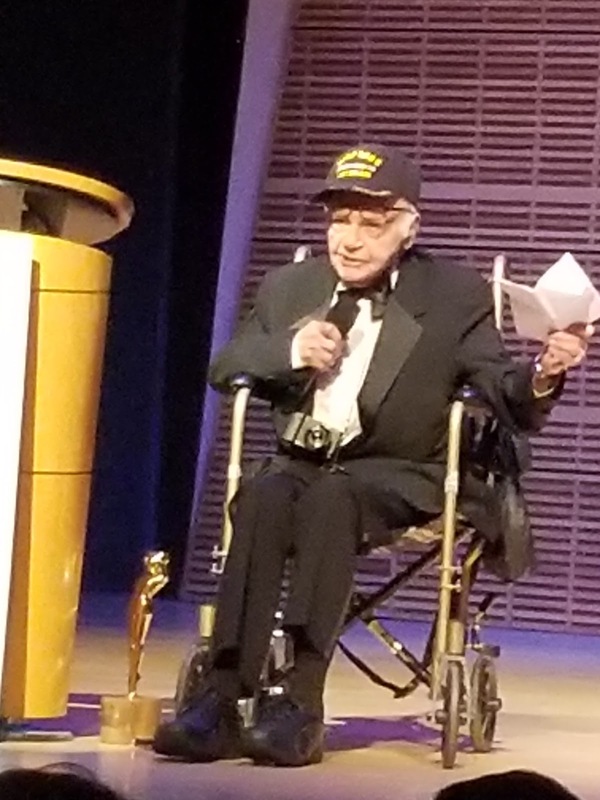 Art Shay, now 95, speaking after being honored with the Lucie statue for Lifetime Achievement during the Lucie Awards gala ceremony at Carnegie Hall in New York October 29, 2017. “Art Shay: A Tribute” is currently on view at Monroe Gallery of Photography through November 19, 2017. 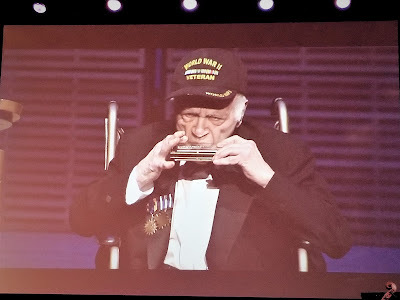 Art Shay brought the crowd to its feet with a rousing harmonica solo to conclude the evening. 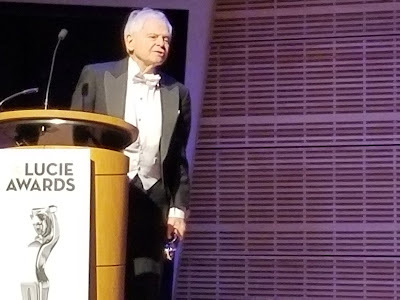 Congratulations to Gallery photographers Steve Schapiro and Art Shay!